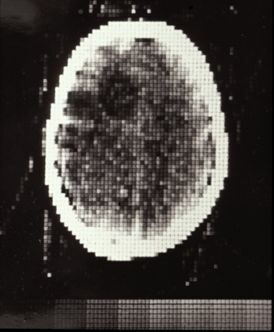 The first clinical CT scan on a patient took place on 1st October 1971 at Atkinson Morley's Hospital, in London, England. The patient, a lady with a suspected frontal lobe tumour, was scanned with a prototype scanner, developed by Godfrey Hounsfield and his team at EMI Central Research Laboratories in Hayes, west London. The scanner produced an image with an 80 x 80 matrix, taking about 5 minutes for each scan, with a similar time required to process the image data. Current CT scanners can produce images with an 1024 x 1024 matrix, acquiring data for a slice in less than 0.3 seconds, and are an integral part of a modern hospital's imaging resources. Computed Tomography (CT) builds on developments in two fields - X-ray imaging and computing. X-rays were discovered in 1895 and within a few years were an established medical tool. By the 1930s, tomography was being developed, enabling the visualisation of sections through a body. By the 1960s, several researchers had worked independently on cross-sectional imaging, culminating in Hounsfield's work at EMI developing computed tomography (CT) for the EMI Scanner. 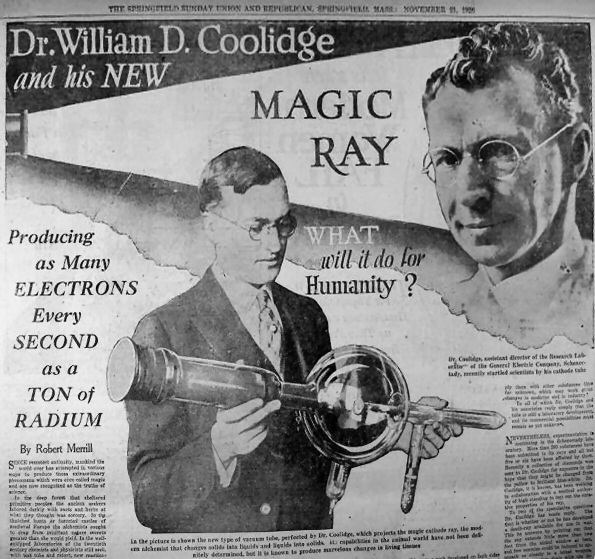 This device relied on the reconstruction of image data by computer, the data being acquired from multiple X-ray transmissions through the object under investigation. Following the first clinical scan in 1971, the patient with the suspected frontal lobe tumour was operated on. The surgeon performing the operation is reported to have remarked that "it looks exactly like the picture" shown above. The successful demonstration of the worth of CT lead to further demonstration systems being installed in London, Manchester and Glasgow in the UK and at the Mayo Clinic and Massachusetts General Hospital in the USA. The first clinical scan in the USA was performed at the Mayo Clinic in 1973. 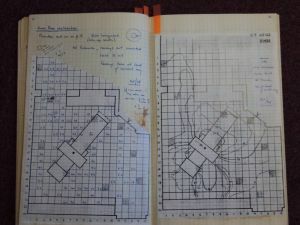 Papers relating to the first commercial scanner to be installed, the EMI Head CT Scanner at the Manchester Royal Infirmary, and of later EMI scanners installed in Manchester, are held in the Papers of Ian Isherwood collection at the John Rylands University Library, Manchester. By 1975, EMI were marketing a body scanner, the CT5000, the first of which was installed at Northwick Park Hospital in London. 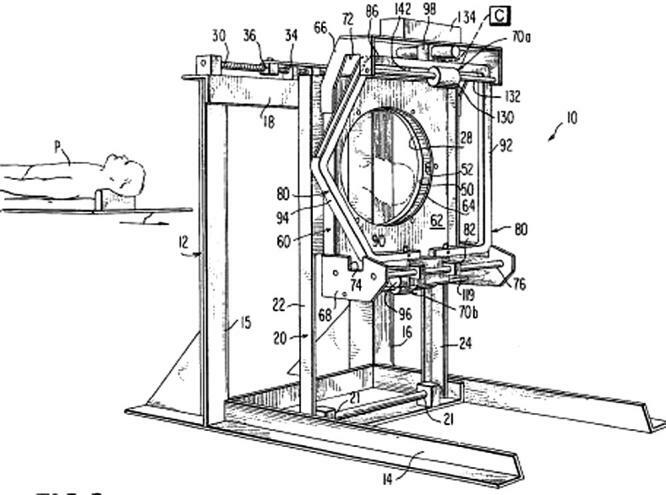 The first body scanner in the USA was installed at the Mallinkrodt Institute and had its first clinical use in October 1975. By this time scan time had been reduced to 20 seconds, for a 320 x 320 image matrix. The mid-1970s were a time of rapid development in CT: 1976 saw 17 companies offering scanners, with scan times down to 5 seconds in some cases. By 1978, there was an installed base of around 200 scanners in the USA, image matrix sizes were up to 512 x 512 and some models of scanner had the capability of ECG-triggered scans. It was also around this time that the ImPACT group was established at St George's Hospital in London, with funding from the UK Department of Health and tasked with evaluating CT scanners for the UK NHS. By the end of the 1970s the importance of CT scanning to medicine was clear: Hounsfield and McCormack received the Nobel Prize for Medicine in 1979, for the independent work on developing the theory and technology of CT scanning, and in 1981 Hounsfield received a knighthood for his work. The 1980s saw incremental development of CT scanner technology: shorter scan times and increased matrix sizes, until by the late 1980s scan times were down to only 3 seconds and matrix sizes were up to 1024 x 1024. Development continued through the 1990s, with the introduction of spiral (continuous) scanning in the early 1990s and the development of multi-slice scanners, with 4-slice scanners and 0.5 second scan times being 'state-of-the-art' by the end of the century. Development of CT scanner technology continued through the early years of the 21st century, particularly with multi-slice scanners. At the time of writing, high-end scanners were offering up to 320 slices, dual-source and dual-energy x-ray sources and iterative reconstruction techniques. CT is not the only cross-sectional modality in use in medical imaging today. Magnetic Resonance Imaging (MRI) was introduced commercially in 1980, a few years after the introduction of the PET scanner. Each device has its advantages: PET gives functional information whereas MRI and CT give structural information. The PET/CT scanner, which combines information from a PET scan and a CT scan in a single device, was introduced in 2000. The timeline below gives key events in the history of CT and related medical imaging technology.